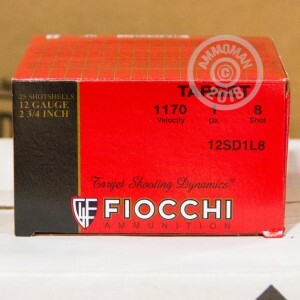 Grab this 25 shell box of 12 gauge ammunition from Fiocchi for clay or upland bird shooting and enjoy great patterns at a low cost. These 2-3/4" shells fire a one ounce column of #8 birdshot at a relatively modest muzzle velocity of 1,170 feet per second. 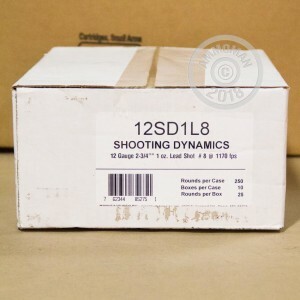 The light recoil of these shells makes them ideal for new shooter training or extended sessions. 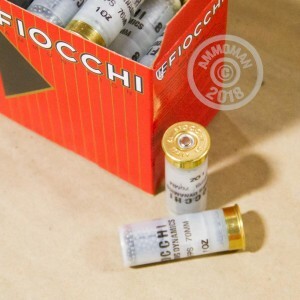 Fiocchi shotshells sold in the US are primarily made in Ozark, Missouri; occasionally, some ammo is imported from the company's headquarters in Lecco, Italy. Pick up a few of these boxes and get free shipping from AmmoMan.com--it's an easy way to save and applies automatically to any order over $99.